Opposition National Democratic Congress has issued a gloomy picture ahead of the 2020 elections warning that the country is likely to be thrown into deep chaos. The party explained that they will do all they can to resist any form of malpractices and show of bias towards them by the Electoral Commission. The party’s position comes on the back of what they insist is the abysmal performance of the EC during the just ended referenda where allegations of widespread malpractices were reported. In a media interaction on Thursday, Deputy General Secretary of the largest opposition party, Peter Otukonor accused the Electoral Commissioners of doing the bidding of the President and government of the day. This he noted will receive stiff opposition from the NDC and may result in anarchy the country may never recover from. “We wish to make clear and draw the attention of all concerned, including those in the diplomatic community and our development partners, that we in the NDC will not allow or permit the manipulation of the processes leading to the 2020 elections” he added. The press conference was also used as a medium to address the issues regarding the Ghana Card and the 2020 elections. The NDC believes it is a way of disenfranchising Ghanaians especially people within the NDC strongholds to ensure smooth victory for President Akufo-Addo in the 2020 polls. They questioned the rationale behind the refusal of EC to accept Voters’ ID Card and other national IDs for the registration for Ghana Card that is currently being accepted used even by the EC. The party made known their plans to kick against any new voter register that will be put together ahead of the 2020 polls using the Ghana Card. “We wish to serve notice to Jean Mensah and her lieutenants especially Dr. Bossman Asare at the Electoral Commission; that the National Democratic Congress (NDC) will not accept any new electoral register compiled based on the Ghana Card which excludes voter ID cards as a means of identification or registration” peter Otukonor told the gathering of press. On ROPAA, the NDC accused Akufo-Addo government of scheming to organise the votes at NPP dominated countries to disadvantage other parties. 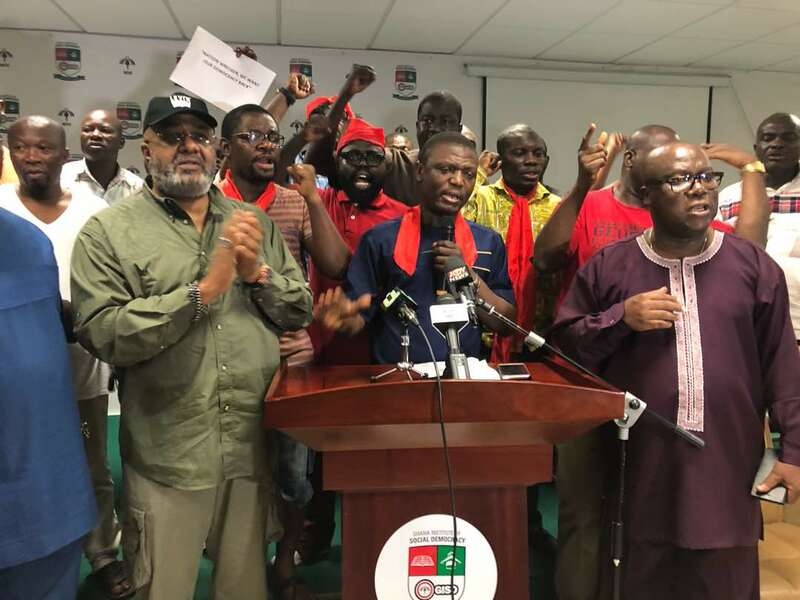 STATEMENT ON THE CONDUCT OF REFERENDA ON THE CREATION OF SIX NEW REGIONS AND MATTERS ARISING: DELIVERED BY COMRADE PETER BOAMAH OTOKUNOR, DEPUTY GENERAL SECRETARY OF THE NDC ON BEHALF OF COMRADE JOHNSON ASIEDU NKETIAH, THE GENERAL SECRETARY OF THE NDC. Ladies and Gentlemen of the press, Members of the Diplomatic Corps, Representatives of Civil Society Groups, On behalf of the National Democratic Congress (NDC), I extend to you New Year greetings. It is our hope that we will in the coming years deepen our bonds of cooperation for the good of Ghana.